Kahneman is a Nobel Prize winner in economics. His focus is on personal decision making, especially the biases and heuristics used by the unconscious mind as it forms intuitive opinions. Biases lead to regular (systematic) errors in decision making. Kahneman and Amos Tversky developed prospect theory, a model of choice, that helps explain why real people make decisions that are different from those of the rational man of economics. Kahneman is a psychologist so his work focuses on the individual; many of his observations are not immediately linkable to safety culture (a group characteristic). But even in a nominal group setting, individuals are often very important. Think about the lawyers, inspectors, consultants and corporate types who show up after a plant incident. What kind of biases do they bring to the table when they are evaluating your organization's performance leading up to the incident? The book* has five parts, described below. Kahneman reports on his own research and then adds the work of many other scholars. Many of the experiments appear quite simple but provide insights into unconscious and conscious decision making. There is a lot of content so this is a high level summary, punctuated by explicative or simply humorous quotes. Part 1 describes two methods we use to make decisions: System 1 and System 2. System 1 is impulsive, intuitive, fast and often unconscious; System 2 is more analytic, cautious, slow and controlled. (p. 48) We often defer to System 1 because of its ease of use; we simply don't have the time, energy or desire to pore over every decision facing us. Lack of desire is another term for lazy. We fall for the anchoring effect, where we see a particular value for an unknown quantity (e.g., the asking price for a used car) before we develop our own value. Even random anchors, which provide no relevant information, can influence decision making. Part 3 focuses on specific shortcomings of our thought processes: overconfidence, fed by the illusory certainty of hindsight, in what we think we know, and underappreciation of the role of chance in events. Part 4 contrasts the rational people of economics with the more complex people of psychology, in other words, the Econs vs. the Humans. Kahneman shows how prospect theory opened a door between the two disciplines and contributed to the start of the field of behavioral economics. When people do consider vary rare events, e.g., a nuclear accident, they will almost certainly overweight the probability in their decision making. “ . . . people are almost completely insensitive to variations of risk among small probabilities.” (p. 316) “. . . low-probability events are much more heavily weighted when described in terms of relative frequencies (how many) than when stated is more abstract terms of . . . “probability” (how likely).” (p. 329) Framing of questions evoke emotions, e.g., “losses evokes stronger negative feelings than costs.” (p. 364) But “[r]eframing is effortful and System 2 is normally lazy.” (p. 367) As an exercise, think about how anti-nuclear activists and NEI would frame the same question about the probability and consequences of a major nuclear accident. In a possibly more significant area, the life satisfaction score you assign to yourself is based on a small sample of highly available ideas or memories. (p. 400) Ponder that the next time you take or review responses from a safety culture survey. We have discussed Kahneman's work before on this blog, e.g., his view that an organization is a factory for producing decisions and his suggestion to use a “premortem” as a partial antidote for overconfidence. (A premortem is an exercise the group undertakes before committing to an important decision: Imagine being a year into the future, the decision's outcome is a disaster. What happened?) For more on these points, see our Nov. 4, 2011 post. We have also discussed some of the topics he raises, e.g., the hindsight bias. Hindsight is 20/20 and it supposedly shows what decision makers could (and should) have known and done instead of their actual decisions that led to an unfavorable outcome, incident, accident or worse. We now know that when the past was the present, things may not have been so clear-cut. Kahneman's observation that the ability to control attention predicts on-the-job performance (p. 37) is certainly consistent with our reports on the characteristics of high reliability organizations (HROs). “The premise of this book is that it is easier to recognize other people's mistakes than our own.” (p. 28) Having observers at important, stressful decision making meetings is useful; they are less cognitively involved than the main actors and more likely to see any problems in the answers being proposed. Critics' major knock on Kahneman's research is that it doesn't reflect real world conditions. His model is “overly concerned with failures and driven by artificial experiments than by the study of real people doing things that matter.” (p. 235) He takes this on by collaborating with a critic in an investigation of intuitive decision making, specifically seeking to answer: “When can you trust a self-confident professional who claims to have an intuition?” (p. 239) The answer is when the expert acquired skill in a predictable environment, and had sufficient practice with immediate, high-quality feedback. For example, anesthesiologists are in a good position to develop predictive expertise; on the other hand, psychotherapists are not, primarily because a lot of time and external events can pass between their prognosis for a patient and ultimate results. However, “System 1 takes over in emergencies . . .” (p. 35) Because people tend to do what they've been trained to do in emergencies, training leading to (correct) responses is vital. Another problem is that most of Kahneman's research uses university students, both undergraduate and graduate, as subjects. It's fair to say professionals have more training and life experience, and have probably made some hasty decisions they later regretted and (maybe) learned from. On the other hand, we often see people who make sub-optimal, or just plain bad decisions even though they should know better. There are lessons here for managers and other would-be culture shapers. System 1's search for answers is mostly constrained to information consistent with existing beliefs (p. 103) which is an entry point for culture. We have seen how group members can have their internal biases influenced by the dominant culture. But to the extent System 1 dominates employees' decision making, decision quality may suffer. We should note Systems 1 and 2 are constructs and “do not really exist in the brain or anywhere else.” (p. 415) System 1 is not Dr. Morbius' Id monster. **** System 1 can be trained to behave differently, but it is always ready to provide convenient answers for a lazy System 2. The book is long, with small print, but the chapters are short so it's easy to invest 15-20 min. at a time. One has to be on constant alert for useful nuggets that can pop up anywhere—which I guess promotes reader mindfulness. It is better than Blink, which simply overwhelmed this reader with a cloudburst of data showing the informational value of thin slices and unintentionally over-promoted the value of intuition. (see pp. 235-36) And it is much deeper than The Power of Habit, which we reviewed last February. 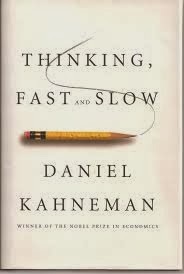 * D. Kahneman, Thinking, Fast and Slow (New York: Farrar, Straus and Giroux, 2011). ** WYSIATI – What You See Is All There Is. Information that is not retrieved from memory, or otherwise ignored, may as well not exist. (pp. 85-88) WYSIATI means we base decisions on the limited information that we are able or willing to retrieve before a decision is due. **** Dr. Edward Morbius is a character in the 1956 sci-fi movie Forbidden Planet.